Star Escape info about the game-Games2Rule. 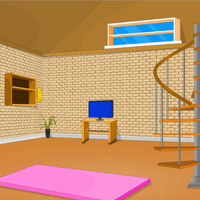 Star Escape is another type of point and click new escape game developed by Games2rule.com. In this game you are trapped inside a star house. The house main door is locked from outside. How will you escape? Can you escape from there? Now it's time to showing your escaping skill. Search for clues, useful objects and use them at right way for escape from that star house. Good Luck Have a fun.